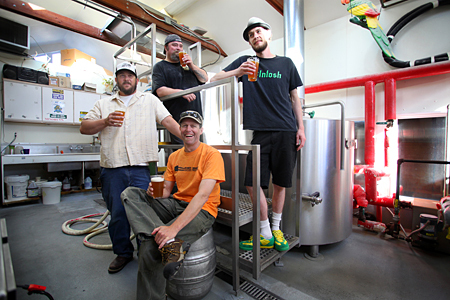 Pictured, clockwise from bottom: Jack Harris (Fort George), Vince Berg (Seaside Brewing Co.), Rich Amacher (Bill’s Tavern) and John Dalgren (Astoria Brewing Co.). The four collaborated on the “to-be-named” brew that will be featured during two weekends of Beer 101 on Oregon’s North Coast. What happens when four creative brewers make one single beer that defines Oregon’s North Coast? Beginning October 18, you can taste for yourself the unique collaboration from the brewers of Astoria Brewing, Fort George, Seaside Brewing and Bill’s Tavern. Brewed with organic two-row malted barley, crystal malts, malted wheat, peat-smoked malt and five gallons of local blackberry honey, this beer is a beautiful, deep, smokey-red Wee Heavy Scotch Ale that is slightly peaty and very malt forward. The brewers used just enough mildly spicy hops to balance and give perspective to this big ale. To get a taste of the brew, you can head to any of the 14 brewpubs and restaurants in Astoria, Seaside and Cannon Beach who have the beer on tap from October 18 – 27. Even better: grab tickets to one of the brewers dinners, tasting tours or talks that are part of the Beer 101 event lineup on Oregon’s North Coast during the month of October. Wherever you go tasting, make sure you cast your vote for naming the collaborative brew – the most creative entry will win three weekend getaways to Astoria/Warrenton, Seaside and Cannon Beach. Check out http://special.kgw.com/beer101/index.html for all the details and to enter to win. The beer name I just submitted (Neahkahnie Nectar) combines north coast treasure lore with the beeswax that has washed ashore for over 300 yrs to highlight this NW treasure brew of barley, malts, wheat and hops infused with blackberry honey.